We can always use gift cards — Home Depot, Orchard Supply, or other local hardware or building supply store cards, American Express Gift Cards (you can generate them from your Membership Rewards points) are the most useful to help us purchase the things we need to make home repairs. Because we work in construction, we naturally use a lot of construction materials and appreciate whenever someone can assist us with an in-kind gift. Due to our limited storage space, we must always coordinate your donation of materials or supplies with our current project needs. This will allow us to make immediate use of your gift without having to locate storage. Please contact our Project Manager to ensure donation acceptance and facilitate its delivery. With that in mind, one of the most valuable gifts we could receive would be ~600 square feet of storage or warehouse space. We’ll try our best to make room for other donations, but we promise to take in anything that occupies less physical space, such as postage stamps (tiny but useful!) and frequent flyer miles. 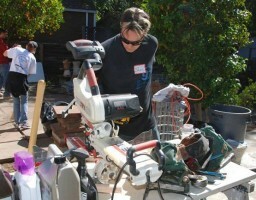 The value of in-kind gifts is always fully tax deductible. 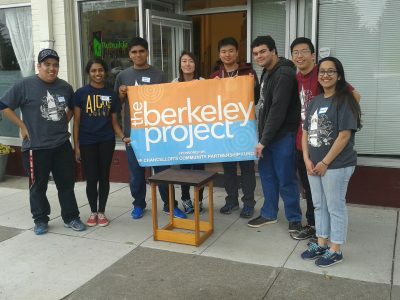 Spring 2017’s volunteer team from the Berkeley Project with a table that they built.